Wife-Respected Smt. Lona Ji & Son-Respected Sh. Vijay Dass Ji. Harh Di Sangrand 1584, Bikrami Samvat (1528) at Banaras. WAJAIDA, NAAM KAMBIR, TILOCHAN, RAVIDAS, DHANNE BENI DE PADE GAWTA. In the hymn “Begumpura” Guru Ravidass Ji postulates the world of his dreams. There will be no distress, no tax, no restriction from going and coming, no fear in the world. It will be an ideal place to live in. The preamble of the Charter of the United Nations has been prepared in conformity with theme of this hymn. He was famous for his spiritual perfection. A large number of kings and queens became his disciples. 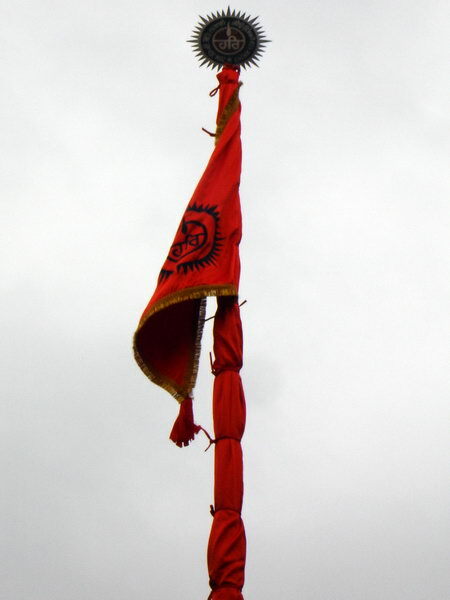 Prominent among them were Raja Pipa, Raja Nagar Mal, Rani Jhalan Bai, Meera Bai. The kings had built many temples dedicated to Guru Ji but these were later either demolished or converted into worship places of other faiths. Satguru Ji spoke high of his Chamar caste. He addressed the ‘nagar janan’ – the residents of Benaras in particular and masses in general that ‘meri jaat(i) bikhiaat chamaarn’. He told the then king that Chamar caste is well-known. Since he had taken shelter in the Naam of the Lord, even the leading and distinguished Brahmans bowed down flat before him in reverence. As per “Shri Guru Ravidass-Life and Writings” Edition 1993 of learned author Dr. Lekh Raj Parwana, Mata Loona, wife of Guru Ravidass Ji, was humble and she extended her full co-operation for success in the mission of her husband. By virtue of her blissful behaviour she was taken as goddess by the devotees. As recorded by learned author Dr. Lekh Raj Parwana at Page 116-117 in his book “Shri Guru Ravidass-Life and writings” first edition 1993, Guru Ravidass Ji visited Northern India twice. Firstly, he was accompanied by Kabir Ji, Tarlochan Ji, Sain Ji and Dhanna Ji and met Guru Nanak Dev Ji at Chuharkana, now known as Nankana Sahib where Guru Nanak Dev served them food with Rs.20/- which had been given to him by his revered father Mehta Kalu Ji for some profitable business. At his second visit to Punjab, Guru Ravidass Ji met Guru Nanak Dev Ji at Sant Ghat of Kali Bein in Sultanpur Lodhi. At third time he met Guru Nanak Dev Ji at Guru Ka Bagh, Benaras and exchanged their views on several topics pertaining to religion, social system and liberty of human beings. Guru Ravidass Ji gave gift of his VANI of 40 hymns and one couplet to Guru Nanak Dev Ji as desired by him. 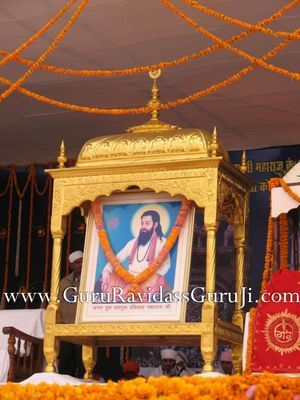 Guru Ravidass Ji is said to have visited Mathura, Prayag, Haridwar, Kurukshetra, Godavari, Sultanpur, Panghat, Ranipur, Bhagalpur, Naraingarh, Nagpur, Bija, Bhopal, Jhansi, Bundi, Udaipur, Jodhpur, Ajmer, Bombay, Hyderabad Kathiawar, Karachi, Bahawalpur, Kala Bhag, Kohat, Khaibar Pass, Jalalabad, Srinagar, Dalhousie, Gorakpur, and widely preached his philosophy. As such, wherever he went large number of people came under his influence and became his devotees. It is due to his itinerary that he is known in entire India. Guru Ravidass Ji held discussions with Guru Nanak Dev Ji, Satguru Kabir Ji and Sant Ramanand Ji against prevalent social, religious, economic and political persecution. Topics of casteless and classless society, oneness of God, equality and human rights were discussed. He was one of the pioneers of Bhakti Movement. It was reformatory wave against ritualistic worship and other evils with which society was gripped. Worship was given a fresh simple definition. Predominantly, all saints of ideal thought joined Bhakti Movement. Since the mode of worship preached by them was free from rituals, people of different faiths became their devotees. It was a period of religious renaissance. He lived for about 151 years. He was able to bring about a sea change in socio-religious environment of our society. His sermons are relevant even today as in the 15th century A.D. All human beings may derive inspiration from his teachings and hymns and enlighten their lives. improved immediately. She was very happy. 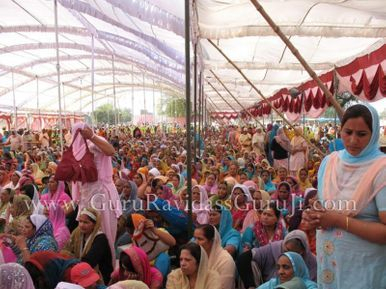 She told the parents of Guru Ji, that a large number of babies have taken birth through her. The parts of body of this infant are peculiar. She has never seen such a baby. She predicted that as a result of his deeds, the family will become famous. After a lapse of 600 years Sant Sarwan Dass Ji of Dera Sach Khand Ballan, district Jalandhar (Punjab, India) traced the birthplace of Guru Ravidass Ji at Seer Govardhanpur, Benaras. 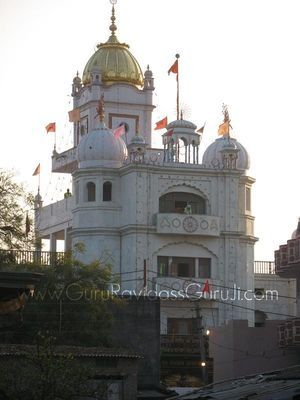 As a result of strenuous efforts of Sant Sarwan Dass Ji, Sant Hari Dass Ji and Sant Garib Dass Ji, a 7-storey grand temple has been constructed at the birthplace. It has now become Ultimate Place of Pilgrimage for the devotees in India and abroad. There is an imli tree quite adjacent to the mandir site. When the foundation stone of the temple was laid it was a dry trunk of the tree. Sant Hari Dass Ji watered the tree daily so long as he stayed there. The tree became live again. To-day it is big tree. The pilgrims pay their obeisance at this place also. resisted. She stretched her arms around and caught hold of Guru Ji and uttered as to who you were? Guru Ji pulled his hands from her hold and put both his hands on her eyes and said, “Mother you see who am I”. Guru Ji took off his hands from her eyes. She opened her eyes. Her eye-sight was normal. She had the glance of beautiful face of Guru Ji. She touched his feet in reverence. ”Fortunate are your parents in whose family you have taken birth”, she complimented to Guru Ji. Guru Ji came back to his house. Karmawati wanted to have still more darshan of Guru Ji. She came to house of parents of Guru Ji. She narrated the entire story. She congratulated his parents for having such a godly son. As Guru Ji attained boyhood, he remained absorbed is spiritual activities for most of his time. His father wanted him to take up ancestral occupation. Although he did help his father in his profession but he did not take keen interest in it. He was mostly in detached mood. His parents were worried about of his future. By and by he started religious discourses, Casteist people used to laugh at him that being of low caste, he is talking of spirituality. But he continued his discourses. His parents planned his marriage that he could engross himself in his family life and stop spiritual leanings. He was married to a religious minded girl name Lona Devi of Mirzapur. She handled all domestic work at her in-laws. She was a noble lady. She cooperated her husband in spiritual discourses. Guru Ji had one son Vijay Dass. In book ‘The Chamars’ G.W. BRIGGS writes ‘Name of his wife was Lona that of his son Vijay Dass’.